Salcura Zeoderm is 99% natural and is free from steroids and harsh chemicals that will further irritate sensitive skins. 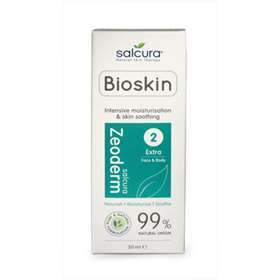 Salcura Bioskin Zeoderm Repair Moisturiser is a natural skin therapy for those prone to more severe cases of eczema, psoriasis, dermatitis, urticaria and dry skin conditions. Reduces redness of skin and inflammation. Apply to face and body as often as needed.